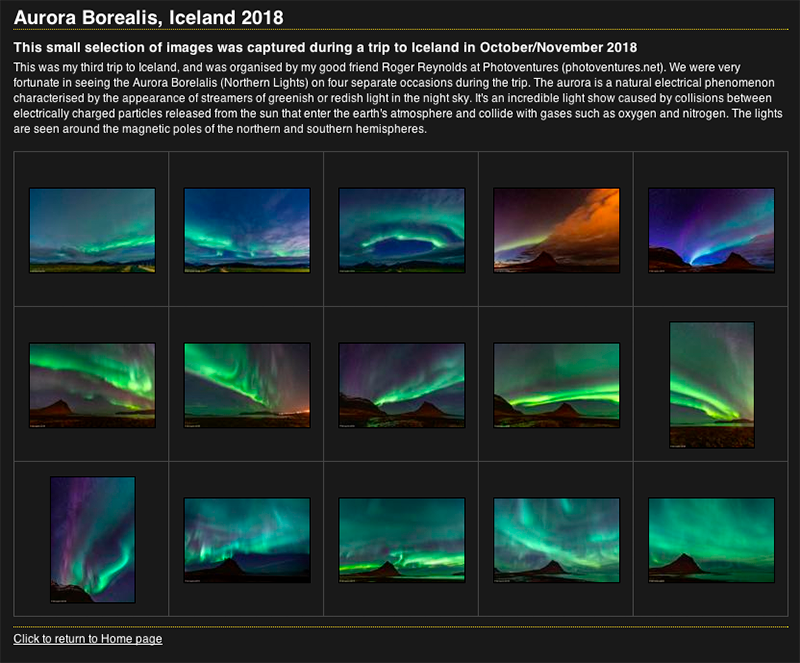 I’ve just uploaded a gallery of photos from my trip to Iceland in October/November. During the trip we were very fortunate to see the Aurora Borealis (Northern Lights) on four separate occasions/locations. The aurora is a natural electrical phenomenon characterised by the appearance of streamers of greenish or reddish light across the night sky. It’s an incredible light show caused by collisions between electrically charged particles released from the sun that enter the earth’s atmosphere and collide with gases such as oxygen and nitrogen. The aurora is seen around the magnetic poles of the northern and southern hemispheres. This entry was posted in Aurora Borealis, Iceland, Lightroom Classic, Lightroom Classic. Bookmark the permalink.